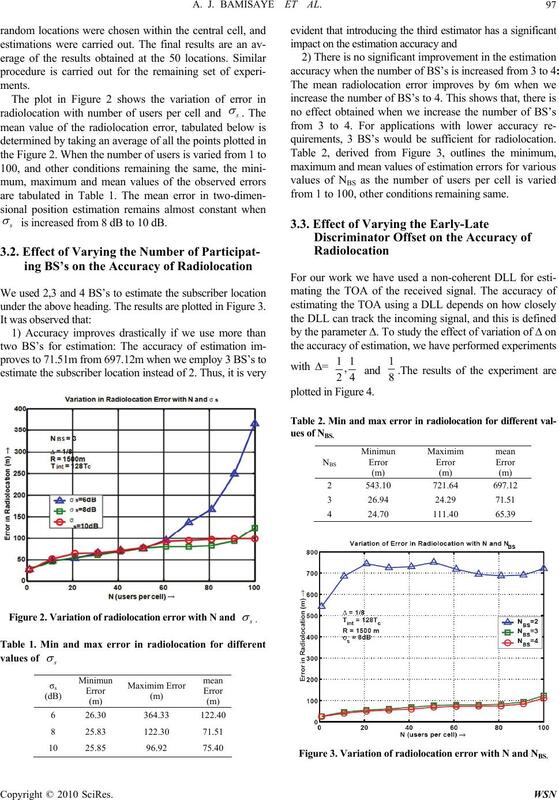 number of users per cell on the accuracy of radiolocation estimation was presented. mating location using position location algorithms [4,5]. Radiolocation in CDMA cellular network. 1 represents such a situation. 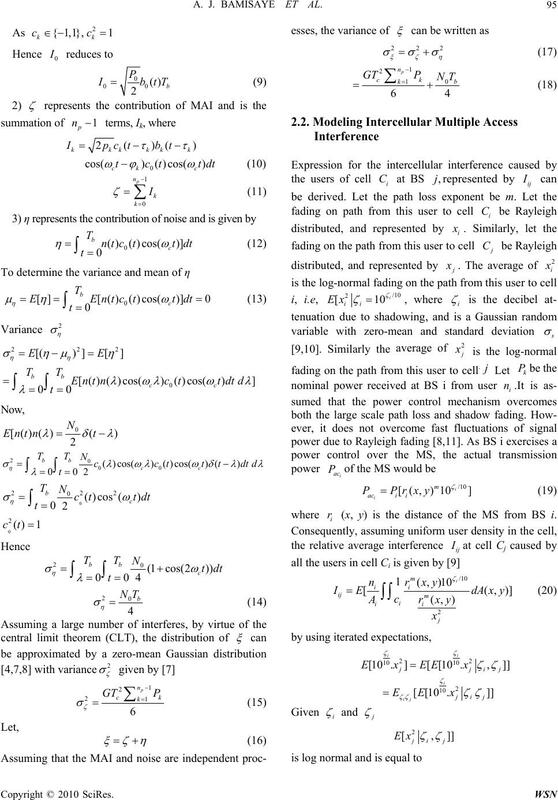 cells have been considered for simplicity of explanation. ck (t) is the spreading (or chip) sequence for a user k.
bk (t) is the data sequence for a user k.
is the delay for user k relative to a user 0.
is the phase change for user k relative to a user 0. T represents the chip repetition period. PN sequence would be repeated for every bit period Tb. Z0 is a decision statistic for the desired user. 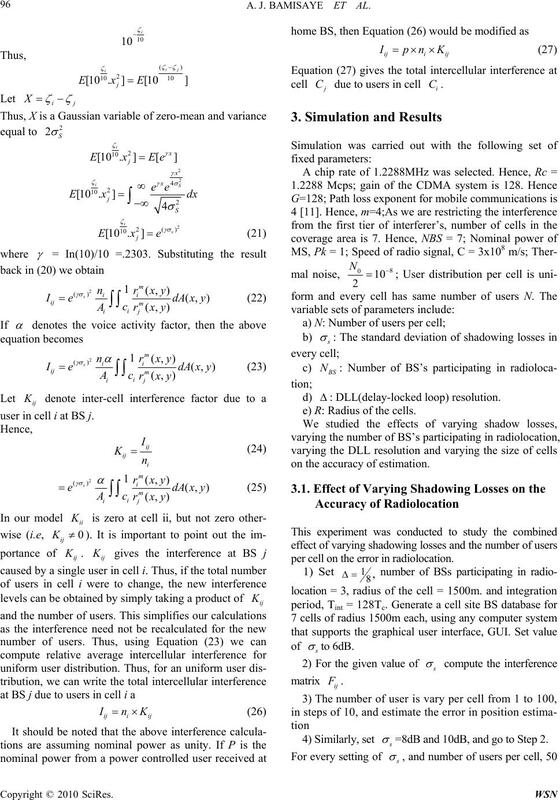 of the MS from BS i.
user in cell i at BS j.
e) R: Radius of the cells. per cell on the error in radiolocation. =8dB and 10dB, and go to Step 2.
is increased from 8 dB to 10 dB. irements, 3 BS’s would be sufficient for radiolocation. from 1 to 100, other conditions remaining same. Figure 3. 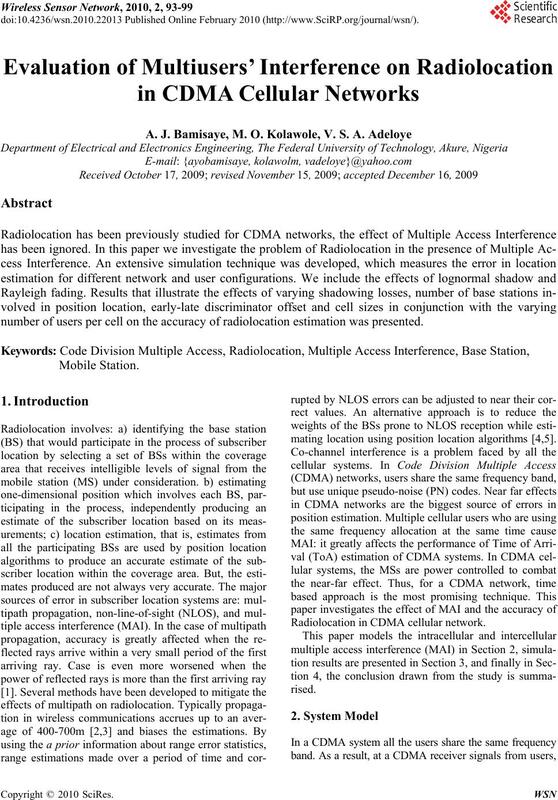 Variation of radiolocation error with N and NBS. would be inefficient for such cases. Figure 4. 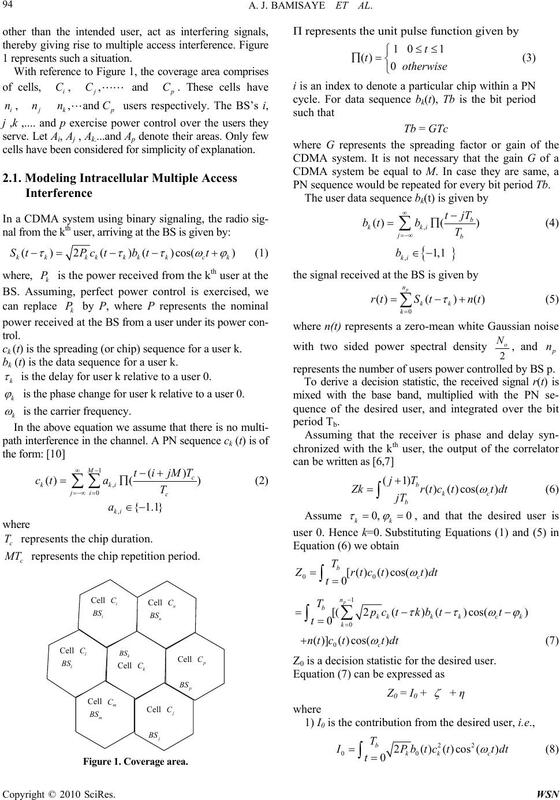 Variation of radiolocation error with N and ∆. Also, accuracy falls as number of users per cell increases. number of users is varied from 1 to 100 in steps of 10.
is better with smaller cells. 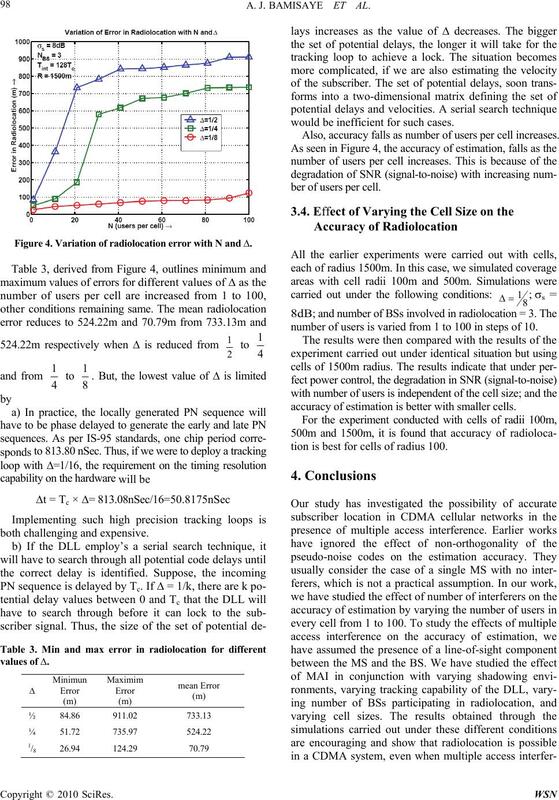 is best for cells of radius 100.
of IEEE ICUPC, pp. 827–831, 1996.
technology, Vol. 47 No. 2, pp. 406–15, May 1998. 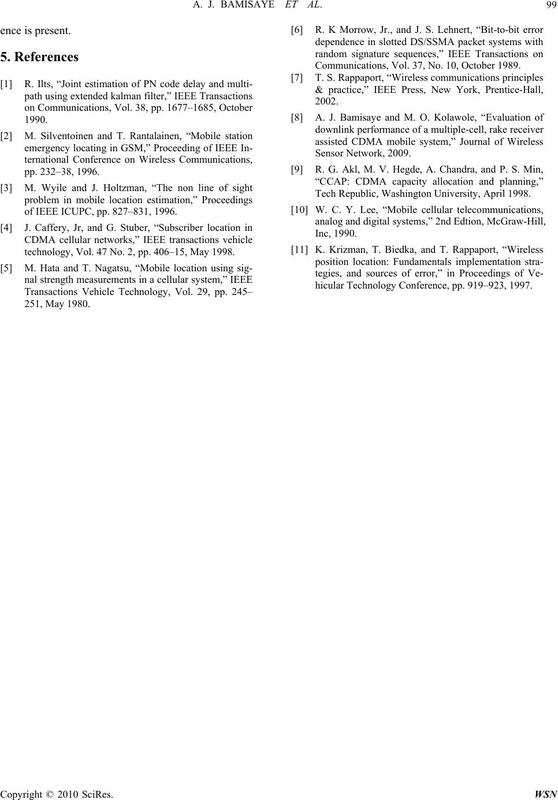 Communications, Vol. 37, No. 10, October 1989. Tech Republic, Washington University, April 1998.